A decade ago Gabon set aside 10% of its land for national parks. It wanted to become Africa's version of Costa Rica - a magnet for eco-tourists. But turning Gabon's natural assets into tourist cash has been tougher than expected. "They're body-surfing in the waves, it's quite amazing." Before they do anything at all, they ask you for a lot of money” - Rombout Swanborn Tourism investor. 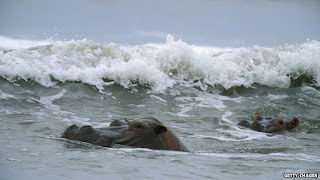 So says my guide, Wynand Viljoen, as he recalls seeing hippos along this part of the Atlantic coast of Africa, just south of the equator. This is what led National Geographic, in a 2004 article, to call Gabon "the land of the surfing hippos". During my short stay, I'm not so lucky. I don't get to see any hippos playing in the ocean. But I am astonished to see two African forest buffalo wandering along the beach. The buffalo look like cattle, with coats the colour of cinnamon and horns that curve backwards. They don't look like they belong here - on this strip of white sand where the rainforest meets the sea. "It looks even weirder if you see the elephants," says Mr Viljoen. And you often do see elephants on the beach. All sorts of animals wander this rare stretch of undeveloped coast. Just inland, Mr Viljoen shows me forest elephants, western lowland gorillas, red river hogs, and fresh leopard tracks in the sand. This is Loango National Park, one of 13 Gabonese national parks established by presidential decree in 2002, and which cover 10% of the whole country. Conservationists hailed the move as a way to protect Equatorial Africa's endangered animals and dwindling forests. Gabon saw the parks as a way to boost their economy, long dependent on oil. The idea was to turn Gabon into the African equivalent of Costa Rica - a country that has profited from its rainforests and wildlife through eco-tourism. Of all the new parks in Gabon, Loango held perhaps the greatest potential to lure international tourists, given its rare wildlife and unusual coastal setting. Gabon is co-hosting, with Equatorial Guinea, this year's Africa Cup of Nations football tournament. For the Gabonese authorities, this has been a unique opportunity to show to the world that they can organise events like this and that they are open to foreign visitors. I have been lucky enough to have visited Gabon twice recently: A year and a half ago as a tourist, and in the last few days as a journalist covering CAN 2012. Both times getting a visa has been easy and I have not had a single problem travelling overland on my own. People are extremely friendly and hospitable. And in contrast to its neighbours - Cameroon, Equatorial Guinea and the Republic of Congo - I have never been asked for money at its frequent checkpoints. However, it is still a difficult destination for all but the most hardened travellers. Although most of its roads are in very good condition, it is not easy to get to the main tourist attractions, including Loango National Park. And, this being a country used to oil money, accommodation at hotels and lodges can be prohibitively expensive for many individual travellers. But, as a businessman told me a couple of days ago in Libreville, the government knows that its oil reserves are drying up quickly and it will have to get its act together and seriously encourage alternative sources of revenue, including tourism. From the start though, it was clear that bringing tourists to an out-of-the-way corner of this underdeveloped country would take serious investment. That's when Rombout Swanborn stepped in. "No single investor would have done in this country what I have done," he says. Mr Swanborn is Dutch, but grew up in Gabon. His father worked for the Shell oil company. As an adult, Mr Swanborn made millions in the oil industry, and at the time Loango was being created, he used part of his fortune to open a tourist operation here. "It was actually meant to function as a demonstration project," he says. "I'd hoped that in our wake more people would see that Gabon would be a viable area to invest in." At first, Mr Swanborn's investment seemed to pay off. Within a few years, Loango Lodge - as it was called - was drawing several thousand visitors a year, many from the US and Europe. It was the busiest tourist operation in Gabon. The tourist cash provided local employment, and supported conservation work on gorillas, elephants and sea-turtles. In 2008, the British Guild of Travel Writers named Loango the top new tourist destination in the world. But then, two years ago, Loango Lodge shut down. "As a pioneer, it became victim to the fact that Gabon wasn't really ready," says Lee White, a British-born biologist who pushed for the creation of Gabon's national parks and helped launch the tourist and conservation effort at Loango. Now he is director of Gabon's national park service. "When you're trying to move a country that has no experience with tourism to become a tourist-friendly country, there are huge challenges," he says. Transport in Gabon is unreliable. Hassles with police and immigration officials are common. Investor Rombout Swanborn says, for some time, he was able to circumvent these problems. He bought his own planes and flew tourists directly to Loango from throughout the region. But Mr Swanborn says he faced problems with Gabon's civil aviation authority, an agency considered so ineffectual by the European Union, it put Gabon on an air safety blacklist. "Before they do anything at all, they ask you for a lot of money," says Mr Swanborn. He says he refused to give money when officials asked for it. "We were not ready to pay an extravagant additional tax. We knew it wouldn't benefit the country - let's put it that way." The government grounded his planes. Mr Swanborn tried to bring tourists to Loango by other means, involving a four-hour boat ride down the coast, followed by a car ride on pot-holed roads. But that proved too inconvenient and time-consuming for many tourists. Bookings dried up and the lodge shut down. This may seem a straightforward tale of a well-meaning businessman stymied by alleged African corruption and inefficiency, but others who were involved say it is not that simple. They say Mr Swanborn didn't do enough to build trust with the Gabonese, and that undermined his efforts. "The definition of eco-tourism is this: You have to help local people. You have to share the benefits," says Rene Adiaheno, a former head of Gabon's national park service. Mr Adiaheno says as an eco-tourism operator, Mr Swanborn should have done more to train and employ local villagers. Romain Calaque was an early employee at Loango who now works for the Wildlife Conservation Society in Gabon. He says Mr Swanborn didn't always take government rules and regulations seriously. "The government became very upset, and it was almost impossible to find a way to get all the partners back around the table," he says. Mr White says it boiled down to a clash of cultures - an aggressive European businessman operating in a country where people prefer to avoid conflict. "You know, everybody made mistakes," he says. "The truth is there are both good and bad on both sides." Whatever went wrong at Loango, Mr White remains optimistic about the eco-tourism potential of Gabon. He says things are beginning to look up. For one, the country has a new President, Ali Bongo Ondimba, who has given some signs he wants to root out the corruption that plagued this country under the former president, his father, who held office for 42 years. The new government is negotiating with tourism companies to build as many as nine new national park lodges in the next few years. Loango Lodge may also have a future. Mr Swanborn recently announced he will re-open it. He is renovating the facilities and says he is trying to resolve his differences with the government so he can resume flights. For now, though, his planes remain grounded, and visitors are scarce. Everyone involved hopes things will go better this time because what is at stake isn't just money. If tourist cash doesn't flow into the economy here, pressure could mount to open Loango and the other national parks to other forms of revenue. And the land that was set aside for the hippos in the surf, and the buffalos on the beach, could be handed over to people who value this place for other reasons - to extract its timber, minerals and oil. Additional reporting by Rob Hugh-Jones.